As we approach the end of 2015 (I know, where has this year gone? ), I find myself reflecting on the year, what has gone well, what hasn’t. If you’re anything like me, you know it’s easy to get caught up in the day-to-day annoyances or problems, and not always look at the bigger picture. 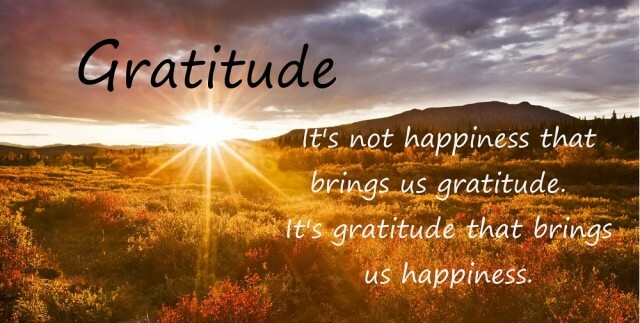 Research says experiencing gratitude can increase happiness and self-esteem. Gratitude can also increase resilience, something we wish to cultivate in all our kids. There are positive health benefits as well, including sleeping better, which I know I can always use! • Start a gratitude journal. It can be handwritten or done on a computer or phone, but some space to write down everything, big and small, you are grateful for. I know for me having another thing to do every day sounds overwhelming, so this may be an every few days or every week thing. • Spend more time in nature. Just this morning I took a hike with a friend and our kids (I know not realistic in other parts of the country, but I am grateful to live in Southern California.). Being outside and exerting my body challenges me and makes me feel a part of something larger. • Express your gratitude. I pledge to let people know how grateful I am for them, and what specifically they have done to make me feel that gratitude. • Don’t take our blessings for granted. It’s sounds cheesy, but appreciate every day, even the tough ones. A friend of mine’s husband recently passed away, which was a huge wake up call to me about how fleeting (and unfair) life can be. • Watch your language. It’s easy to get mired down in negativity and complaints. When I try to reframe my language and situations, I usually do feel better. • Make an effort to help others less fortunate. It’s easy to get busy in the craziness of our lives, but take time to help others less fortunate. This could be helping feed the homeless or “adopting” a family at holiday time. As parents, our kids are watching our actions and words, so when we make an effort to live gratefully, we are teaching them to do so too. What are your ideas for embracing gratitude? Happy Holidays and Happy New Year from all of us at TEEN LINE!